Hello again! Thought you might like to see the card I made for my husband a few days ago. I knew the “believe” would be a perfect set up for the inside sentiment, which would mean absolutely nothing to anyone but him 🙂 He loved it! The cardbase is my usual Neenah Solar White 80 lb. 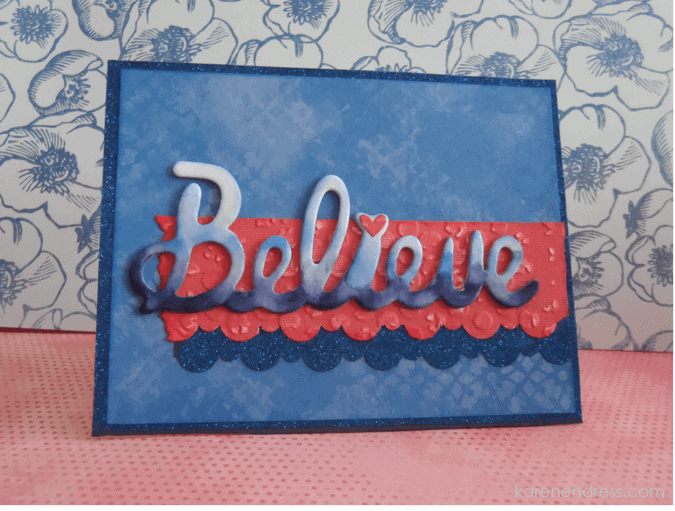 covered with royal blue glitter paper (DCWV mat stack), layered with patterned paper from DCWV’s Summer Dream Stack, another oldie but goodie. 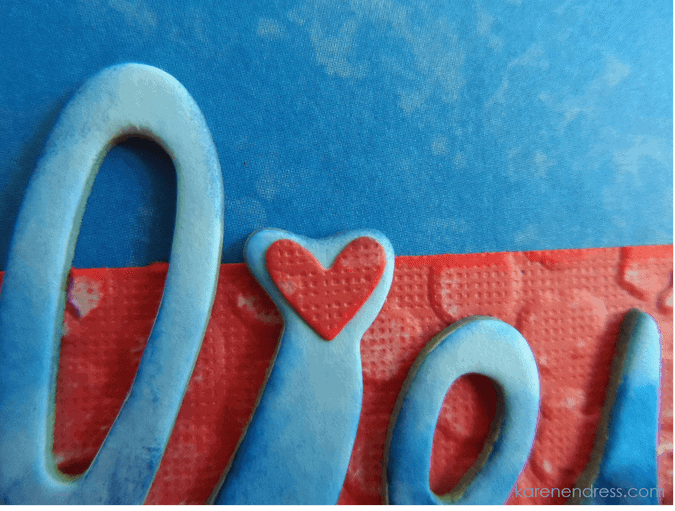 I wanted the dark coral strip to mimic the blue paper’s mottled pattern, so I ran a piece from the DCWV Brights Border punch strip stack through Tim Holtz/Sizzix Bubble embossing folder, then sanded the raised areas with an emery board. For even more interest, I inked the sanded portions as well as all the panels’ edges with Distress inks in Chipped Sapphire and Abandoned Coral, then punched one edge with the Fiskars interchangeable border punch cartridge Up in the Clouds. 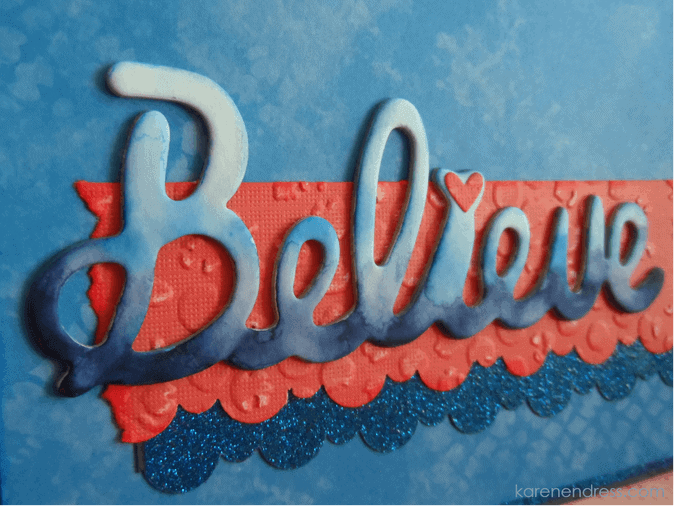 I used the same punch on a scrap of the glitter paper and layered them onto the card. The chipboard die cut is from this Recollections Color Splash collection embellishment pack I found in the 80% off clearance bin at Michaels. I’ve already used three of them (card posts to come 🙂 and have plans for the other two! That’s the kind of bargain I just love!! 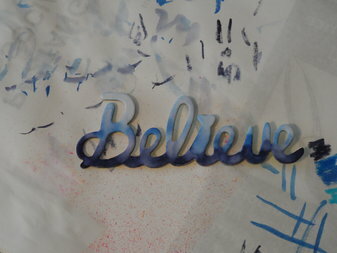 One of the embellishments after watercoloring! I used my Zig Clean Color Real Brush markers in deep blue & Persian blue to try to get an ombre effect. They didn’t blend as well as I had hoped, either because the surface was of a lower quality or I just need more practice with these markers.